I kind of like seeing the CEO of Wells Fargo on the hot seat in front of the house and senate for the fraudulent opening of customer accounts. 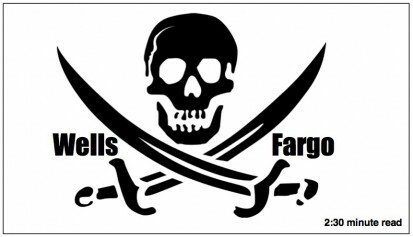 I always felt Wells Fargo’s conduct in general and their attitude toward their customers was criminal. I just didn’t know how accurate my sentiments were. Don’t get me wrong. The rank and file are nice enough and hard working. But they’re hamstrung by policies from on high that prevent them from acceding to customers needs. And the imprint of senior management is imbedded in information systems that spit out a dizzying array of fees, penalties and abusive policies. But the joy in seeing CEO Stumpf’s discomfort is short-lived however. That’s because bad behavior provokes regulation. Further, scandal-driven legislation, however well-meaning, tends to make doing business more difficult, more expensive and undermines competitiveness. The Enron/Worldcom accounting scandal gave us the Sarbanes-Oxley Act. The financial crisis produced the Dodd-Frank Act. What will Wells Fargo give us? Bid rigging: In 2012, 16 banks are found to have manipulated the benchmark LIBOR rate which underpins as much as $500 trillion of financial instruments. Money laundering: HSBC Exposed U.S. Financial System to Money Laundering, Drug and Terrorist Financing Risks according to the Homeland Security Permanent Subcommittee on Investigations. Racism: In 2012, Wells Fargo paid $175 million to resolve allegations it charged African-Americans and Hispanics higher rates and fees on mortgages even when they qualified for better deals during the housing boom. Fraud: In 2010 Wells Fargo, JP Morgan Chase, Bank of America, GMAC and Ally Financial were implicated in an epidemic of improper foreclosures which included so-called robo-signing, a process of mass producing false and forged mortgage assignments, satisfactions and other documents. More fraud: In 2010, Angelo Mozilo, former executive of mortgage lender Countrywide Financial paid $67.5 million to settle SEC charges he mislead investors about the quality of Countrywide’s loans. Lying: In 2013, The Justice Department collects $13 billion from JP Morgan Chase for misleading investors about securities containing toxic mortgages. In 2016, The Justice Department sought $14 billion against Deutsche Bank for similar charges. PS: If you’re in college, major in compliance.